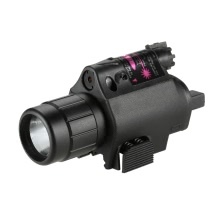 Compact flashlight and red dot sight combo 2 in 1 function. Suitable for red sight alignment, aiming and positioning, hunting and spotting, search and rescue, outdoor and hiking. Compact flashlight and red dot sight combo. Clear and extra bright beam. Quick release mounting, easy for installation and removal. 3 modes available: flashlight only, red dot sight only and flashlight & red dot sight. Fits for most 21mm tactical firearms with or without rail slots. Dual switches: Button switch and cord switch. Fully adjustable for windage and elevation with wrench(included). Suitable for red sight alignment, aiming and positioning, hunting and spotting, search and rescue, outdoor and hiking. Note: Do not look directly into the beam, and do not point the beam at other person&apos;s eyes.